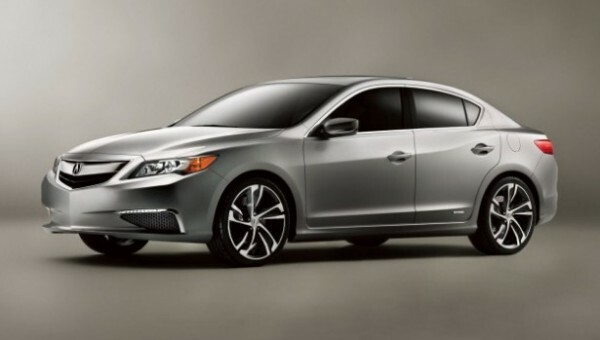 The new Acura car range for 2013 includes three new Acura ILX models. The most basic version comes with 150 horse power and a superb 2.0 liter 4 cylinder engine. It’s not just about the performance though as it also comes equipped with some very high-end features such as automatic climate control, a Sequential Sport Shift 5-speed automatic transmission and a unique Reactive amplitude suspension for superior comfort and ride quality. The Acura 2.4L ILX has a slighter higher spec with a more robust performance that includes a 2.4 liter 4-cylinder engine but this time with 201 horse power, a quick-shifting 6-speed manual transmission and 17-inch wheels. The final new model in the range is the ILX hybrid. This is a great car for people who want to use less fuel and do their bit for the environment as it uses an efficient 1.5 liter 4-cylinder engine coupled with an electric engine too – and when used in tandem they will kick out 111 horse power while achieving an EPA-estimated fuel consumption just 38 miles per gallon with highway driving. In addition to the long list of standard features, available upgrades include a Premium package and a technology package that includes such features as an Acura ELS Surround premium audio system, HID headlights, the excellent Acura Navigation System and much more. Safety is a design principle that is crucial for the Acura division (Acura are owned by Honda) and is one aspect to their cars that there are trying to push more so they can gain greater market share in North America and the United States. With that in mind, the new Acura ILX safety systems not only protect the vehicle occupants, but also go some way to creating a safer driving environment for the occupants of other vehicles and walking pedestrians. Some of these safety items include an Advanced Compatibility Engineering (ACE) body structure, a full complement of airbags in rear and front, plus Vehicle Stability Assist (VSA) with a new motion adaptive electric power steering function to help drivers avoid trouble. This will alert the Acura drivers if any obstacles suddenly appear and will apply the brakes automatically – for example, if a pedestrian steps out into the road. Various tests have been conducted on the new Acura models and show that the Acura ILX conforms to all the top safety ratings in both the federal (NHTSA) and independent (IIHS) crash test scenarios. The Acura ILX has been given a five star rating by NHTSA and looks set to receive superb customer feedback over the next 12 months as the car becomes more widely available in the official dealerships. All the new ILX models come with a GPS device actually built-in to the car’s dashboard. The Acura Navigation System is very advanced and lets the driver make hands free phone calls, tell the GPS where to take them using voice commands, and offers turn by turn directions with both 2D and 3D mapping graphics. The Acura Navigation System uses Navteq maps and the driver will need to update these annually using an Acura Navigation DVD. The new DVD contains updates when roads change meaning that the Acura GPS can be updated so that it remains current and still works when driving. About the Author: This review of the 2013 Acura ILX was written exclusively by Bob Simmons. Bob is an expert in automotive and GPS niches, and has recently published information on the latest Acura Navigation DVD 2012 – which is the disc referred to in this review for drivers you want to update the Acura GPS Navigation System that comes with all three ILX models.